The nursing diagnosis of Ineffective Airway Clearance is defined as the inability to clear secretions or obstructions from the respiratory tract to maintain a clear airway. 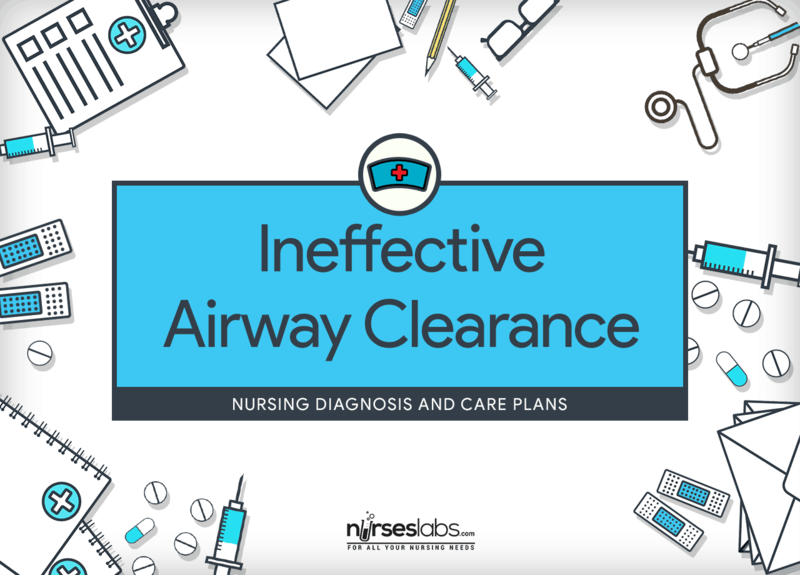 Use this nursing diagnosis guide to formulate your Ineffective Airway Clearance care plan. Breathing comes naturally and effortlessly to everyone. But there are some who are incapable of keeping their airways clear and their lungs healthy. Maintaining a patent airway has always been vital to life. When a problem concerning the airway happens, coughing takes place, which is the main mechanism for clearing it. However, coughing may not always be easy to everyone especially to those patients with incisions, trauma, respiratory muscle fatigue, or neuromuscular weakness. Mechanisms that exist in the lower bronchioles and alveoli to maintain the patency of the airway include the mucociliary system, macrophages, and the lymphatics. Also, anesthesia and dehydration can alter the function of the mucociliary system. Thus, increased production of secretions in conditions such as pneumonia and bronchitis can oppress these mechanisms. Ineffective Airway Clearance can be an acute (e.g., postoperative recovery) or chronic (e.g., CVA or spinal cord injury) problem. High-risk for ineffective airway clearance are the aged individuals who have an increased incidence of emphysema and a higher prevalence of chronic cough or sputum production. There is a wide range of airway clearance interventions that nurses can choose from when they are teaching the patients and family members the strategies of secretion removal. In general, these interventions are done to maintain a patent airway, improve comfort and ease of breathing, improve pulmonary ventilation and oxygenation, and to prevent risks associated with oxygenation problems. The following are the common goals and expected outcomes for Ineffective Airway Clearance. Patient will maintain clear, open airways as evidence by normal breath sounds, normal rate and depth of respirations, and ability to effectively cough up secretions after treatments and deep breaths. Patient will demonstrate increased air exchange. Patient will classify methods to enhance secretion removal. Patient will recognize the significance of changes in sputum to include color, character, amount, and odor. Patient will identify and avoid specific factors that inhibit effective airway clearance. Continuous assessment is necessary in order to know possible problems that may have lead to Ineffective Airway Clearance as well as name any concerns that may occur during nursing care. Assess airway for patency. Maintaining patent airway is always the first priority, especially in cases like trauma, acute neurological decompensation, or cardiac arrest. Auscultate lungs for presence of normal or adventitious breath sounds, as in the following: Abnormal breath sounds can be heard as fluid and mucus accumulate. This may indicate ineffective airway clearance. These may indicate presence of a mucous plug or other major obstruction. This may indicate partial airway obstruction or resistance. This may indicate presence of secretions along larger airways. Constant breath sounds of both rhonchi and wheezing; normally treated with bronchodilator. Frequently occurs in combination with nasal flaring and intercostal or subcostal retractions, associated with increased work of breathing. Clicking, rattling, or crackling sound heard during inspiration and expiration. Continuous low-pitched, rattling lung sounds that often resemble snoring. High-pitched, musical breathing sound caused by a blockage in the throat or voice box (larynx). Assess respirations. Note quality, rate, pattern, depth, flaring of nostrils, dyspnea on exertion, evidence of splinting, use of accessory muscles, and position for breathing. A change in the usual respiration may mean respiratory compromise. An increase in respiratory rate and rhythm may be a compensatory response to airway obstruction. Groups of quick, shallow inspirations followed by regular or irregular periods of apnea (10 to 60 seconds). Progressively deeper and sometimes faster breathing, followed by a gradual decrease that results in apnea. The pattern repeats, with each cycle usually taking 30 seconds to 2 minutes. Note for changes in mental status. Increasing lethargy, confusion, restlessness, and/or irritability can be initial signs of cerebral hypoxia. Lethargy and somnolence are late signs. Note for changes in HR, BP, and temperature. Increased work of breathing can lead to tachycardia and hypertension. Retained secretions or atelectasis may be a sign of an existing infection or inflammatory process manifested by a fever or increased temperature. Note cough for efficacy and productivity. Coughing is a mechanism for clearing secretions. An ineffective cough compromises airway clearance and prevents mucus from being expelled. Respiratory muscle fatigue, severe bronchospasm, or thick and tenacious secretions are possible causes of ineffective cough. Note presence of sputum; evaluate its quality, color, amount, odor, and consistency. Unusual appearance of secretions may be a result of infection, bronchitis, chronic smoking, or other condition. A discolored sputum is a sign of infection; an odor may be present. Dehydration may be present if patient has labored breathing with thick, tenacious secretions that increase airway resistance. Submit a sputum specimen for culture and sensitivity testing, as appropriate. Labored breathing may be a sign of respiratory infection that needs an appropriate treatment of antibiotics. Use pulse oximetry to monitor oxygen saturation; assess arterial blood gases (ABGs) Pulse oximetry is used to detect changes in oxygenation. Oxygen saturation should be maintained at 90% or greater. Alteration in ABGS may result in increased pulmonary secretions and respiratory fatigue. Assess hydration status: skin turgor, mucous membranes, tongue. Airway clearance is impaired with poor hydration and subsequent secretion thickening. Assess for abdominal or thoracic pain. Pain can result in shallow breathing and an ineffective cough. Check for peak airway pressures and airway resistance, if patient is on mechanical ventilation. Increases in these parameters signal collection of secretions or fluid and likely for ineffective ventilation. Review patient’s understanding of disease process. Patient teaching will vary depending on the acute or chronic disease condition as well as the patient’s cognitive level. Know if patient considers use of herbal treatment (e.g., echinacea for URTI, goldenseal for pneumonia, ma huang for bronchospasm). Drug interactions with prescribed medications and contraindications need to be evaluated (e.g., ma huang contains ephedrine, which should not be used by patients with increased BP, heart disease, prostate problems, and diabetes). Teach the patient the proper ways of coughing and breathing. (e.g., take a deep breath, hold for 2 seconds, and cough two or three times in succession). The most convenient way to remove most secretions is coughing. So it is necessary to assist the patient during this activity. Deep breathing, on the other hand, promotes oxygenation before controlled coughing. The proper sitting position and splinting of the abdomen promote effective coughing by increasing abdominal pressure and upward diaphragmatic movement. Controlled coughing methods help mobilize secretions from smaller airways to larger airways because the coughing is done at varying times. Ambulation promotes lung expansion, mobilizes secretions, and lessens atelectasis. Position the patient upright if tolerated. Regularly check the patient’s position to prevent sliding down in bed. Upright position limits abdominal contents from pushing upward and inhibiting lung expansion. This position promotes better lung expansion and improved air exchange. Perform nasotracheal suctioning as necessary, especially if cough is ineffective. Suctioning is needed when patients are unable to cough out secretions properly due to weakness, thick mucus plugs, or excessive or tenacious mucus production. This procedure can also stimulate a cough. Frequency of suctioning should be based on patient’s present condition, not on preset routine, such as every 2 hours. Over suctioning can cause hypoxia and injury to bronchial and lung tissue. Using well-lubricated catheters reduces irritation and prevents trauma to mucous membranes. Use curved-tip catheters and head positioning (if not contraindicated). These facilitates secretion removal; from a specific side of the lung (left or right). Instruct the patient to take several deep breaths before and after nasotracheal suctioning procedure and use supplemental oxygen, as appropriate. Hyperoxygenation before, during, and after suctioning prevents hypoxia. Stop suctioning and provide supplemental oxygen if the patient experiences bradycardia, an increase in ventricular ectopy, and/or significant desaturation. Oxygen therapy is recommended to improve oxygen saturation and reduce possible complications. Use universal precautions: gloves, goggles, and mask, as appropriate. As protection against the blood-related modes of transmission, health care workers should use universal precautions when coming in contact with the blood of all patients, or bodily fluids containing blood. Maintain humidified oxygen as prescribed. Increasing humidity of inspired air will reduce thickness of secretions and aid their removal. Encourage patient to increase fluid intake to 3 liters per day within the limits of cardiac reserve and renal function. Fluids help minimize mucosal drying and maximize ciliary action to move secretions. Give medications as prescribed, such as antibiotics, mucolytic agents, bronchodilators, expectorants, noting effectiveness and side effects. A variety of medications are prepared to manage specific problems. Most promote clearance of airway secretions and may reduce airway resistance. Coordinate with a respiratory therapist for chest physiotherapy and nebulizer management as indicated. Chest physiotherapy includes the techniques of postural drainage and chest percussion to mobilize secretions from smaller airways that cannot be eliminated by means of coughing or suctioning. Provide postural drainage, percussion, and vibration as ordered. Chest physical therapy helps mobilize bronchial secretions; it should be used only when prescribed because it can cause harm if patient has underlying conditions such as cardiac disease or increased intracranial pressure. Provide oral care every 4 hours. Oral care freshens the mouth after respiratory secretions have been expectorated. Pace activities especially for patients with reduced energy. Maintain planned rest periods. Promote energy-conservation methods. Fatigue is a contributing factor to ineffective coughing. Effective coughing requires enough energy and may consume an extra effort to the patient. For acute problems, resort in bronchoscopy. Bronchoscopy acquires lavage samples for culture and sensitivity, and eliminates mucous plugs. If secretions cannot be cleared, consider the need for an intubation. Once intubated: Readiness for an emergency helps prevent further complications. Intubation may be needed to facilitate removal of tenacious and copious amounts of secretions and provide source for augmenting oxygenation. Start suctioning airway as determined by the existence of adventitious sounds. Suctioning clears mucus from the tube and is essential for proper breathing. This promotes elimination of viscous secretions. Perform cardiopulmonary resuscitation (CPR) maneuvers for patients with complete airway obstruction. This is used to relieve airway obstructions and to sustain life until definitive treatment can be provided. Educate patient on coughing, deep breathing, and splinting techniques. Patient will understand the underlying principle and proper techniques to keep the airway clear of secretions. Provide patient understanding about the proper use of prescribed medications and inhalers. Understanding prescriptions promote safe and effective medication administration. Consider the need of humidifiers in home care setting. This facilitates liquefaction of secretions. Instruct patient about the need for adequate fluid intake even after hospital discharge. Hydration facilitates easy elimination of secretions. Educate caregivers in suctioning techniques. Provide opportunity for return demonstration. Modify techniques for home setting. This promotes safe and effective removal of secretions from the airway. Consider verbalization of feelings. Recognize reality of situation. Anxiety adds to oxygen demand, and hypoxemia potentiates respiratory distress or cardiac symptoms, which in turn increases anxiety. Explain further the effects of smoking, including secondhand smoke. Chemical irritants and allergens can increase mucus production and bronchospasm. Refer to the pulmonary clinical nurse specialist, home health nurse, or respiratory therapist as indicated. Consultants may be helpful in ensuring that proper treatments are met. Hill, A. T., Barker, A. F., Bolser, D. C., Davenport, P., Ireland, B., Chang, A. B., … & McGarvey, L. (2018). Treating cough due to non-CF and CF bronchiectasis with nonpharmacological airway clearance: CHEST expert panel report. Chest, 153(4), 986-993. Shekleton, M. E., & Nield, M. (1987). Ineffective airway clearance related to artificial airway. The Nursing Clinics of North America, 22(1), 167-178.